This is a parable of Jesus which appears in Matthew 13:47–52 and refers to the final judgment. This parable is the seventh and last in Matthew 13, which began with the parable of the Sower. "Again, the Kingdom of Heaven is like a dragnet, that was cast into the sea, and gathered some fish of every kind, which, when it was filled, they drew up on the beach. They sat down, and gathered the good into containers, but the bad they threw away. So will it be in the end of the world. The angels will come forth, and separate the wicked from among the righteous, and will cast them into the furnace of fire. There will be the weeping and the gnashing of teeth." Jesus said to them, "Have you understood all these things?" He said to them, "Therefore every scribe who has been made a disciple in the Kingdom of Heaven is like a man who is a householder, who brings out of his treasure new and old things." 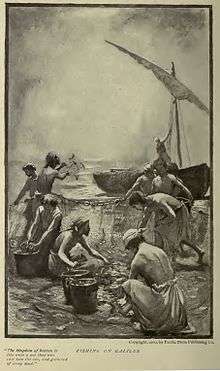 "The Kingdom of heaven is like unto a net that was cast into the sea, and gathered of every kind." Like the parable of the Tares, earlier in Matthew 13, this parable refers to the final judgment. Here, the imagery is drawn from the separation of edible from inedible fish caught by a net, probably a seine net. The passage says that "the angels will come and separate the wicked from the righteous" in a similar way. And wherein does this differ from the parable of the tares? For there too the one are saved, the other perish; but there, for choosing of wicked doctrines; and those before this again, for not giving heed to His sayings, but these for wickedness of life; who are the most wretched of all, having attained to His knowledge, and being caught, but not even so capable of being saved. Jesus' final comments indicate that "true teachers of the kingdom display the kingdom's treasure for all to see." Christ informs us, that a mixture of the good and the bad must be patiently endured till the end of the word; because, till that time, a true and perfect restoration of the Church will not take place. Again, he warns us, that it is not enough, and—what is more—that it is of little consequence to us, to be gathered into the fold, unless we are his true and chosen sheep...[and] that [disciples] might communicate to others what they had received. In this way [Christ] whets and excites their minds more and more to desire instruction. He says that teachers are like householders, who are not only careful about their own food, but have a store laid up for the nourishment of others; and who do not live at ease as to the passing day, but make provision for a future and distant period. The meaning, therefore, is, that the teachers of the Church ought to be prepared by long study for giving to the people, as out of a storehouse, a variety of instruction concerning the word of God, as the necessity of the case may require. Wikimedia Commons has media related to Drawing in the Net. 1 2 R. T. France, The Gospel According to Matthew: An introduction and commentary, Eerdmans, 1985, ISBN 0-8028-0063-7, p. 230. 1 2 Catholic Encyclopedia: Parables. 1 2 Craig S. Keener, A Commentary on the Gospel of Matthew, Eerdmans, 1999, ISBN 0-8028-3821-9, pp. 392-394. ↑ Patrick J. O'Reilly, Light Divine in Parable and Allegory, Kessinger Publishing, 2003 (originally 1930), ISBN 0-7661-3135-1, p. 116. ↑ John Chrysostom, Homily 47 on Matthew. ↑ "John Calvin, Commentary on Matthew, Mark, Luke - Volume 2". Ccel.org. 2005-06-01. Retrieved 2014-08-01.